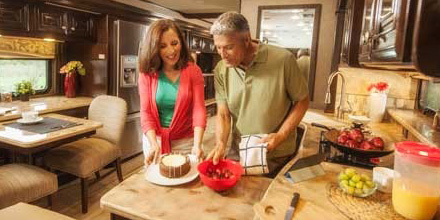 In an RV where space is often at a premium, cooking can be challenging. We love the tips from RVGoddess.com, especially the ones that pertain to cooking in an RV. Here are some great thoughts from one of the recent articles on that website. Organizing your RV kitchen is fun and frustrating at the same time. There never seems to be enough room, and you will most likely reorganize your cabinets several times before you’re happy. Hopefully, these tips and ideas will help you plan and organize your kitchen on wheels. Keep a reputable fire extinguisher in the kitchen and know how to use it. How does the water system work? Is your water safe to drink? Is your refrigerator cold enough (35-40 degrees)? What Items Do You Really Need? Do you really need that blender, hand mixer, or food processor? Measure your storage space carefully. Are you using all of it wisely? For lightweight plastic storage items, shop your local party supply store. Open those cabinets every two or three months and purge them of unused items. You can get the rest of the details on the RVGoddess.com site. Bon appétit!